The Club welcomes and encourages athletes of all abilities to become members and join us for racing and training. Abilities are mixed and range from Age Group World Champions and GB Age Group Athletes to first timers. Club members regularly compete at local, National, European and World competition levels in Triathlon, Duathlon, Aquathlon and other multi-sport events. The Club is affiliated to the British Triathlon Federation and registered with the IRONMAN Tri Club Program. We are also affiliated to the CTT for Cycling Time Trials. •	Aquabike - A swim followed by a bike – a very new event which is starting to become more noticed. •	Duathlon - A run followed by a bike and then a second run to finish – Also run as off-road events to include trail running and mountain bike, Cross Duathlon. •	Relay - Not ready to step up to more than one discipline but still want to be involved then ask about joining us for a relay event and we can match you up with team members. All these events are covered under the rules of the BTF British Triathlon Federation and we encourage you to join here. There are lots of benefits including insurance and discounts available for members and it also saves paying the BTF day license fee at BTF events. Each year we select a few races around the country as ‘Harriers Championship Races’ encouraging more of us to choose these races and create a strong Harriers field at the event. As always, all levels and abilities are encouraged and this provides a great opportunity to meet and race with other likeminded athletes. Additionally, by competing, you’re also in with the exciting chance of winning a trophy at the Annual Harriers Awards night! Swim - Structured swim coaching is held on Saturday mornings throughout Winter and Open Water swimming is organised through the Summer. The Saturday Pool Swim sessions start in September and continue through until April. The indoor swim sessions are held at Trinity Arts & Leisure Facility. The open water swimming facility at Box End Park is used during the Summer months with swim sessions available at various times during the week. Saturdays during Summer there is usually a group swim prior to the weekly cycle ride. Regular cycle rides are arranged on the Facebook group most weekends. These are guided rides with fellow members, no coaching can be given and you are responsible for your own safety. The club cannot be held responsible for accidents, people getting lost etc. We ask that everyone to have sufficient tools to repair a puncture, carry a mobile phone, drink and food as a minimum. Full details of the rides will be posted on the Facebook page. A lot of members use the Beds Road CC time trials as training sessions that run from their clubhouse in Cardington from May to August. This is a great way of measuring improvement and learning pacing for Triathlon & Duathlon events. 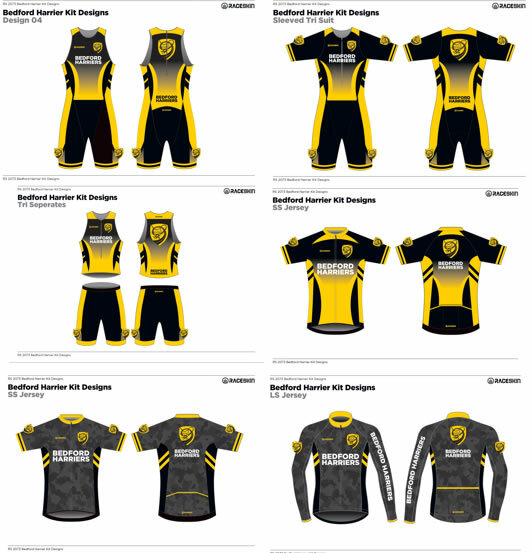 You can also enter any CTT Cycling Time Trial event as a Bedford Harrier. Winter Turbo sessions will take place at Beds Road Cycling Club in the Cardington Club house. Bedford Harriers members are welcome to join in these sessions please see Beds Road CC website or Facebook page for details. Please note that space is limited on turbo sessions so it is advisable to arrive early to secure a space. Run sessions for all abilities are catered for by the Club on Monday & Wednesday nights from Bedford Athletics Stadium. Full details are on this website. Brick run sessions are organised on throughout the year generally after the Saturday cycle rides from Box End Park or the Athletic Stadium, keep an eye on the Facebook Group. Coaches – Please refer to the main Harriers Coaches page for the group best suited to your ability. Did you know you can represent GB for your Age Group? 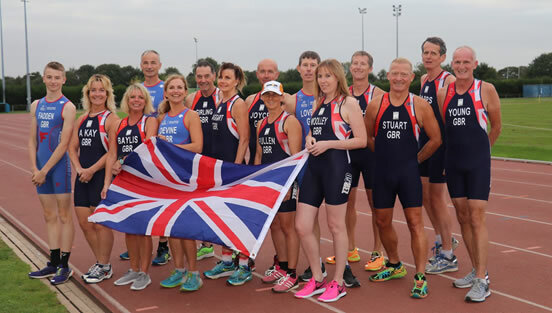 Bedford Harriers has had nearly 20 Team GB representatives in Triathlon and Duathlon. This is a fantastic experience and you may find you are eligible to qualify from previous results. To be a part of the GB Team you must qualify for your specific event and enter through the BTF website. Full details can be found here but also please contact Nick Beardow e-mail n.beardow@beardowadams.com our Team GB coordinator who will be able to assist further and more specifically to your event. For the most up to date information please visit and join the Bedford Harriers Triathlon & Multi Sports Team Group on Facebook. The Club has fantastic camaraderie and great support for fellow athletes and we would love you to come and join us.